You are invited to participate in a pilgrimage this Lent. Rather than a physical walk to a sacred place, you can join a more arduous but more rewarding pilgrimage�a journey into the heart of mercy. 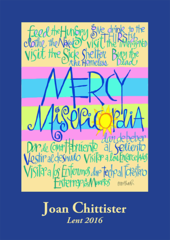 In keeping with the Year of Mercy announced by Pope Francis, Joan Chittister reflects on each Sunday of Lent in her Joan Chittister: Lent 2016. In addition to Sister Joan�s words, this small but weighty 10-paneled pamphlet includes a weekly quote by Pope Francis, an art lectio reflection, an invitation to action, and a mantra. with new people, in new ways. who knows that to be fully human is to forgive wrongs. who do not live life as we do. and celebrates the efforts of the other. Benetvision: Full color 10-panel print publication. Closed pamphlet measures 5" x 7".